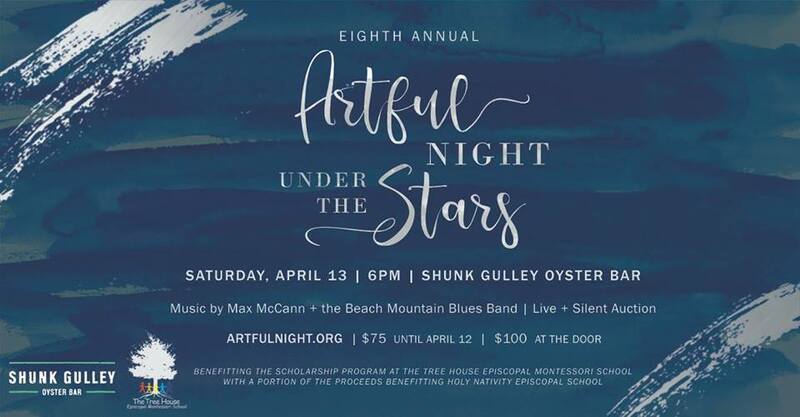 Saturday, April 13, 2019 at 6 PM – 11 PM: Join us for the Eighth Annual Artful Night Under the Stars. The fun will take place Saturday, April 13, 2019 from 6:00 – 11:00 PM at Shunk Gulley Oyster Bar with proceeds benefiting The Tree House Episcopal Montessori School's scholarship program and Panama City’s Holy Nativity Episcopal School. The ticket price of $75 ($100 at the door) includes an incredible selection of coastal cuisine from Shunk Gulley Oyster Bar and two complimentary beer/wine tickets from Carousel Market and Grayton Beer Company. A silent and live auction will include an outstanding array of unique getaways, experiences and a carefully curated assortment of gifts. This year will feature live music downstairs by Max McCann and friends with Pro Sound Entertainment turning up the tunes upstairs for some late night dancing and fun. Sponsorship opportunities available. Attire is Coastal Chic. For more information on Artful Night Under the Stars or the Tree House Episcopal Montessori School, email info@thetreehousectk.org or call 850.622.9771.